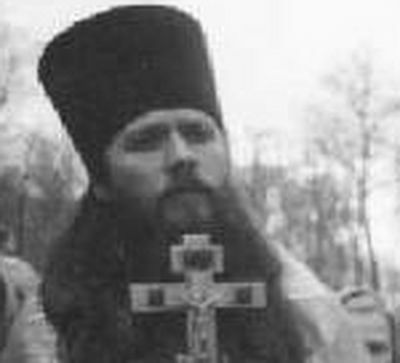 As part of the special project “Mysteries of the Church” Archpriest Artemy Vladimirov speaks on the essence and meaning of each of the seven Mysteries: Baptism, Chrismation, Repentance, Communion, the Mystery of Marriage, the Mystery of the Priesthood, and Unction. Today we will talk about the Mystery of Communion, its meaning, how to prepare ourselves for this Mystery and how to maintain those gifts that a Christian receives in Communion. It is for every one of us who is baptized—those baptized in childhood and those who consciously approached the cleansing waters in adulthood—to have access to the very greatest Mystery: the Communion of the Most-Pure Body and Blood of our Savior under the form of bread and wine. How wonderful that the center of Church life, about which we daily pray in the Lord’s Prayer: “Give us this day our daily bread,” is referred to in Greek as “Eucharist”—“thanksgiving.” It means that, in response to Divine love, manifested in the Incarnation of the Son of God, His ascending the Cross and Resurrection from the dead, in response to all the innumerable blessings of the Trinity, our Redeemer and Judge, we are called to thank Him, participating in the Mystery of thanksgiving, in the Holy Eucharist. As the forefather of the Savior, King David prophesied already a thousand years before the Nativity of Christ: What shall I render unto the Lord for all his benefits toward me? I will take the cup of salvation, and call upon the name of the Lord (Ps. 115:12-13). Thus, the Mystery of Communion is the upholding structure of the world, the vertical, thanks to which heaven and earth abide on their foundations. Until the very hour of the Second Coming of our Lord Jesus Christ the Divine Liturgy will be celebrated by the grace of God in the bosom of the Holy Catholic and Apostolic Orthodox Church. Even in arduous times of persecution the faithful will have the possibility to partake of this Divine food. No scientific mind, no outside research, no fine-spun rationalistic thinking and reasoning will ever manage to comprehend the mystery of the Holy Eucharist: as to how exactly the bread and wine offered at the Mystical Supper of the Redeemer—the Divine Liturgy—materialize and transform into His Most Pure Body and Blood. But the Church undoubtedly believes in this Mystery, celebrated by the power of the Holy Spirit, according to the institution of Christ and Apostolic tradition, with the participation of pastors and flocks, a bishop and his rational flock, daily, until the end of the age. Indubitably, all of our attempts to live in cooperation with the law of God, to fulfill the commandments of Jesus Christ about truth and love, to purge the spiritual and bodily vessel of every defilement of flesh and spirit, to confess, to repent, to pray, to please God by acts of compassion—the sum total of all of our blessed efforts towards the salvation of our soul have one purpose: the willingness, the desire, the craving and hunger for the Communion of the Holy Mysteries of Christ. On the day when we are dignified with the holy things, God fashions out of our hearts an abode by the energy of His Holy Spirit. He abides with us that the Father, and the Son, and the Holy Spirit, One God in Three Persons is known, found in invisible but palpable fellowship with His disciple, with His creation, with His slave, and this is all accomplished in the bosom of our Mother-Church. Today it’s not easy in this turbulent world to maintain a continuous thirst and readiness for Communion of the Holy Mysteries of Christ. After all, per the Apostolic commandments, we are called, no less frequently than once a month, but by desire more often to unite ourselves with Christ, that the Divinity and Humanity of the Savior might sanctify our soul and body, and we might obtain in Holy Communion the strength for bearing life’s cross. The fruit of Holy Communion is clear, pure thoughts, a meek and peaceful heart and flesh, sanctified by the breath of the Spirit, a thankful, joyful disposition of soul, being encapsulated in a slogan short but sweet: “With prayer to God, with love for people”—thus lives a Christian, the heart of whom has become a throne, albeit an invisible throne on which the Heavenly King reposes in His grace. How ought we to prepare ourselves for Holy Communion, that fellowship with Christ would serve not for our condemnation, but salvation? 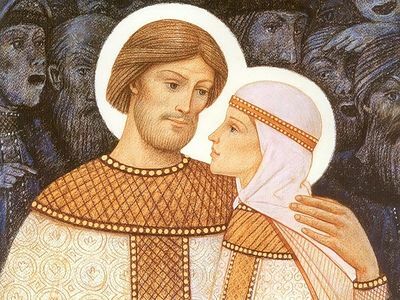 Those who desire to live the married life are called to sanctify their union by the Mystery of Marriage, of which we will speak later. Preparing ourselves to commune of the Holy Mysteries of Christ, we fulfill the Church’s ordinance concerning fasting on Wednesday and Friday. For communicants, those who prepare [говеет] themselves (“говение”—it’s a good Russian word meaning preparation for Divine Liturgy and participation in it), there is prescribed a short Eucharistic fast. As a rule, it pertains to the evening of the day before Communion, and in the morning we come to Liturgy on a strictly empty stomach: and there was evening and there was morning, one day (Gen. 1:5). I am speaking now about Church people who try throughout the whole year with piety to approach the life-giving holy things. Undoubtedly, devoting attention to preparation for the Mystery of Communion, completing the required prayer rule, contemplating the meeting with the Heavenly Visitor, reconciling yourself with all—both those who love us and those who hate us—that nary a dark cloud of resentment, petulance, dissatisfaction, or murmuring might obscure the eye of our heart, a Christian preparing himself to receive the Most Pure Body and Blood of the Savior must attend to preserving himself in purity and honesty. He should make exceptional effort that, having known the Holy Mysteries of Christ, having apprehended for himself the Intelligible Sun—Christ—he not depart to a far country, not turning again to those passions and sinful habits which were the subject of his, of the Christian’s that is, afflicted lamentation and confession on the eve of Holy Communion. This is why it’s so important, having been counted worthy of the holy things, from the heart to attentively thank the Savior, and of the prayers of thanksgiving—five small prayers—to accept them well not only into the mind, but with the heart to embrace their content. Indeed, when we pronounce these hymns of doxology to the Creator: “May Thy holy Body be unto me for life eternal, and Thy precious Blood for the remission of sins; and may this Eucharist be unto me for joy, health, and gladness” it is as if the soul is consecrated anew, or better to say, Christ the Savior is then alive and active in the human heart. But having fulfilled the short prescribed rule of thanksgiving we do not hinder the heart in pouring out its spontaneous, involuntary, child-like glorification of the Creator, recalling how once Jesus Christ, our Savior, having drawn near to the Temple in Jerusalem, was favorably disposed to hear that choir of youths who, under the influence of the Holy Spirit, trumpeted praise to the Savior: "Hosanna in the highest! Blessed is he who comes in the name of the Lord! Out of the mouth of babes and sucklings Thou, Lord, hast been pleased to accept praise and thanksgiving”—these prophetic words apply to and are very crucial for communicants. Having partaken of Communion, we are called until late in the evening to sojourn in a peaceful, placable, joyful, buoyant, uplifting state of soul. With our mouths we can and should pour forth but rosy words, imbued with warmth, peace, and love. A smile, friendliness, geniality, a readiness to dialogue with people in the spirit of reason and wisdom, a readiness to comfort if not by word then by a look—here is the calling card of the communicant. To him is unbecoming any abuse of our earthly gifts. “It is good to eat and drink with thanksgiving," says the Apostle Paul, “for earthly food is sanctified by the word of God and prayer.” Thus the communicant until departing to sleep must not part from the internal praise of the Creator: “Lord, Jesus Christ, Son of God, glory to Thee! Most Holy Theotokos, save and protect me from all evil! By the prayers of all the saints, Lord, enlighten, instruct and aid me! Jesus Christ, Son of God, have mercy upon me!” Or just: “Lord have mercy! Lord have mercy! Lord have mercy!”—in every way, as a nightingale or waxbird, the partaker of the mystery of prayer renders praise to the Holy Trinity. We, wrapping up our meditation upon the Mystery of Communion, again note for ourselves: it is the panacea for all afflictions and ailments. Christ, the Physician of soul and body, uniting with us, gives to man clarity of thought and pacifies the soul. It is as if wings on our back are unveiled on the day in which we receive Holy Communion. And, born to fly, we should no longer crawl, to wander in the ashes of slander, judgment and gossip—all that vulgarity and shrewdness which constitutes the cud of this age, alien, unfortunately, to the Divine holy things. We invite you, dear friends, to the church of the Lord, where you can prepare yourself for the very greatest of the Mysteries of Christ’s Church—the Communion of the Most Pure Body and Blood of our Lord Jesus Christ, partaken of for the remission of sins, for the healing of soul and body and for life everlasting. Fr. Artemy Vladimirov, an English-speaking Moscow priest from the Church of All Saints at Krasnoselskaya, has, for the past decade, been a mainstay for Western Orthodox converts living in Moscow and visitors seeking a deeper spiritual life. His staunchly traditional belief, deep insight, warm humor, and willingness to reach out to souls from diverse backgrounds, have brought more than a few foreigners to Orthodoxy. As the expatriate community has come and gone, Fr. Artemy has generously presided over numerous missionary dinners, high teas, and spontaneous talks—unforgettable gatherings that awaken souls and delight the spirit.